Cooler weather’s moving into the Bluegrass State! Fall offers the perfect climate to explore some of Kentucky’s great parks and trails. Here are five of our personal favorite Kentucky hiking spots. 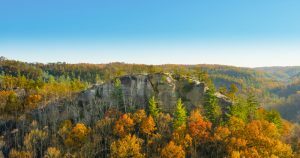 Located just east of Lexington within Daniel Boone National Forest, the Red River Gorge provides miles of hiking trails through its rugged terrain. We suggest studying trail maps ahead of time and creating a loop that hits some of the park’s spectacular scenic overlooks. The Gladie Visitor Center is a great place to get advice before you start your trip. Take a break from hot summer days and travel underneath Kentucky. At Mammoth Cave National Park, visitors can escape to the underground labyrinth that is the Mammoth Cave System. The various cave hikes provide an unforgettable experience. Additionally, the park offers various surface activities including ten miles of front-country trails and over seventy miles of backcountry trails and campsites. Kentucky’s Natural Bridge State Park is located near Red River Gorge within Daniel Boone National Forest. 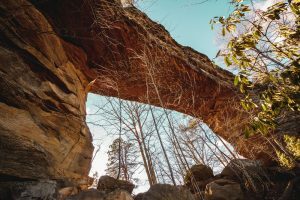 In addition to the picturesque “natural bridge,” visitors can enjoy nearly 20 miles of hiking trails. The park offers several overnight accommodations as well as a 30-acre lake perfect for paddling and fishing. 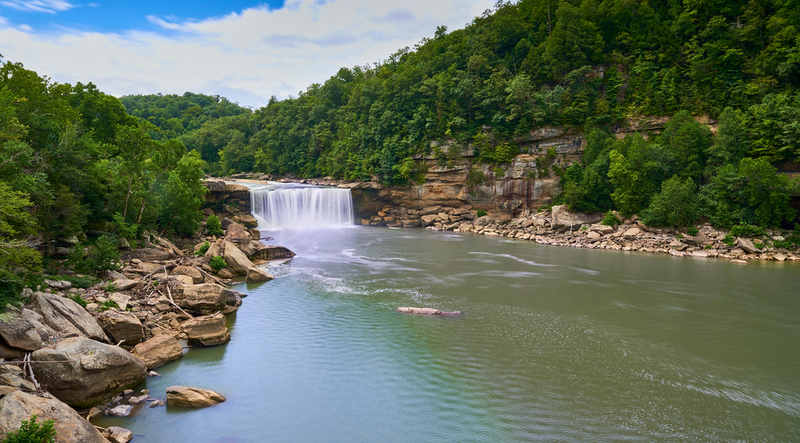 Located in the southeast corner of Kentucky, Cumberland Falls hosts the “Niagara of the South.” The falls are 125 feet wide and nearly 70 feet tall, making them the largest waterfall in the state. 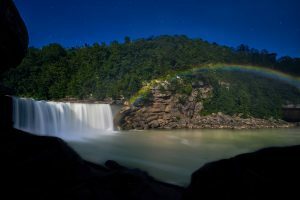 Also, the falls are famous for “moonbow” sightings. Moonbows are essentially rainbows created by moonlight. The park offers 17 miles of trails around the falls. Bernheim Forest is a 15,500+ acre nature preserve located just south of Louisville. The park has a relaxed family-friendly environment with over 40 miles of hiking trails. Additionally, the park hosts Family Fishing Weekends on their 32-acre fishing lake along with several other naturalist programs. Grab your adventurous friends and get started on the weekend hike of a lifetime enjoying all Kentucky has to offer!